T-Mobile is moving toward quad-play services with 5G and Layer3 TV providing the broadband and video portions. However, the wireless carrier will struggle to bring any disruption to the video portion of the bundle. T-Mobile is assembling all the pieces it needs to offer a full quad-play of wireless, broadband, video, and voice. How exactly it plans to achieve it became a little clear as the company talked about its plans in the Q1 earnings call this week. The $146 billion deal to combine T-Mobile with Sprint could help accelerate the rollout of 5G services for both companies. Sprint has promised to deliver a nationwide 5G network by the first half of 2019. T-Mobile says it will have 5G coverage in 30 cities this year and New York, Los Angeles, Dallas, and Las Vegas will be the first to have access to it next year. 5G is important because it can deliver broadband speeds of 450 Mbps, a very competitive speed in today’s broadband market. T-Mobile is not waiting for the 5G network to be complete before it launches its TV service. It plans to launch later this year over existing broadband connections. With T-Mobile launching video service based on Layer3 TV later this year, the company will be in direct competition with other virtual MVPDs like Sling TV, YouTube TV, and DirectTV Now. The competition seriously constrains what T-Mobile can do with the video service. Price is likely the biggest problem for T-Mobile. vMVPDs packages start as low as $20-a-month, with $40-a-month a common entry point. Layer3 TV in LA starts at $75 a month. The TV solution will need to start at half Layer3 TV’s current cost to be competitive. To get the price down T-Mobile must offer smaller channel bundles. Currently, the LA bundle has 275 channels, and Layer3 is likely restricted in how it can put together its bundles. In fact, it is not even clear Layer3 programmer licenses cover an Internet-delivered service at all. Either way, Mr. Legere’s team must be working to obtain the licenses they need. Moreover, the benchmark cost of those licenses has been set by other vMVPDs. By nScreenMedia’s estimates, vMVPDs like YouTube TV are already losing money on every subscription. So, T-Mobile must absorb a bigger loss if it is to price its TV service below competing vMVPDs. All of this means T-Mobile will likely follow the announced strategy of AT&T. It plans to introduce a new vMVPD service omitting expensive sports and major broadcaster channels. This service will be available free to unlimited wireless customers and for $15-a-month to everyone else. Given the constraints he is operating under, and the announced products and strategies of competitors, there simply isn’t any room for disruption left! 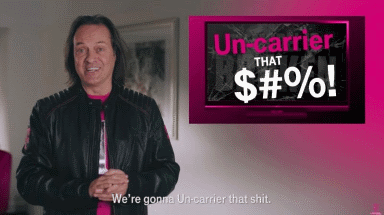 T-Mobile promised to disrupt the business of pay TV. vMVPDs are already disrupting the business by accepting low-or-no-margin pricing. AT&T will introduce a vMVPD later this year which will be free to unlimited wireless customers. Given the constraints programmer licenses will put T-Mobile under there simply isn’t any room for disruption left. Want a customized linear viewing experience? Zone-ify it!